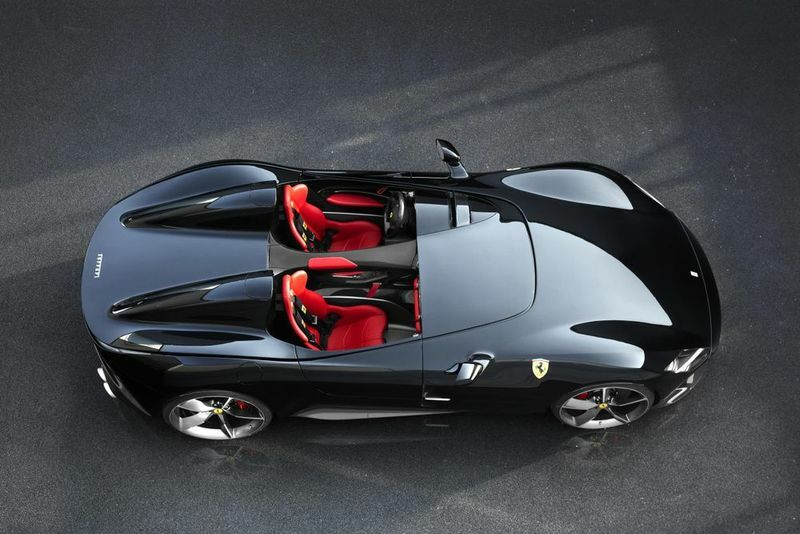 The Ferrari 812 Superfast-derived Monza SP1 and SP2 are the first cars in Ferrari's new 'Icone' range. We’re really struggling to contain the want right now. The cars you see here – the Monza SP1 and SP2 – almost certainly use the 812 Superfast as a starting point (Ferrari hasn’t actually confirmed this), dressing the super GT’s platform and engine up in a preposterously gorgeous speedster-style carbon composite body. The 6.5-litre V12 is just as potent as it is in the 812, developing its 809bhp at a screaming 8500rpm. 0-62mph takes just 2.9 seconds, 0-124mph is over in 7.9, and the top speed is 186mph. Sounds like a recipe for total face destruction, but Ferrari has carefully managed the airflow around the front in the name of comfort. Engineers have added what Ferrari calls a “Virtual Wind Shield,” which diverts the air around the driver to a certain extent. SP1s feature a huge tonneau and a single roll bar. On the SP2 meanwhile, that’s ditched to make room for the additional seat. SP2s also have an additional rollover hoop and protective screen, although the passenger won’t benefit from the “Virtual Wind Shield”. Perhaps mention that before going full throttle for the first time. The interior is a little less retro, featuring a steering wheel that looks to have been lifted from the 812, and a modern instrument cluster with a physical rev counter flanked by screens. That gorgeous, bespoke console to the right of the driver is made from carbon fibre, as is much of the pared-back cabin. The tiny doors open up-and-out, and the bonnet is a one-piece clamshell affair which is hinged at the front. Frustratingly, there aren’t any pictures of it open in the press release. There’s no word on how many Ferrari will make, nor how much it’ll cost, but we’d expect it to be well into the seven-figure range. There’ll be more cars like this coming, too: the SP1 and SP2 are the first cars in Ferrari’s super-exclusive, retro-inspired ‘Icone’ range which was announced in late September 2018.